We could hear the thundering of hooves and feel the vibrations coming through the earth before we could see them. The pounding of so many feet on the ground told us they were getting closer and closer, and there were a lot of them. Suddenly a heard of horses emerged over the crest of the hill and came cantering down towards us. They swept past as they headed for home, all the while being chased by a barefoot cowboy. 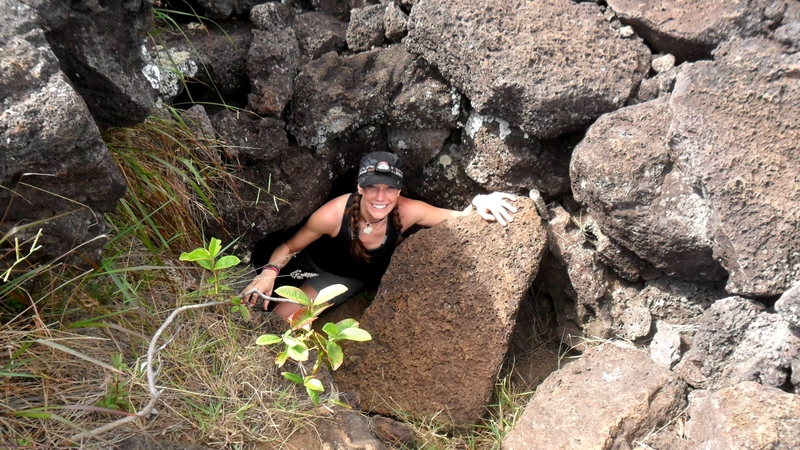 My friend Jo and I were wandering around the island of Rapa Nui, or as its more commonly known as Easter Island, lost out in the middle of the Pacific Ocean. We were on our way back to the island’s only town, Hanga Roa, after spending the day exploring the giant moai’s and lost caves along the coast of this volcanic island. Our feet were aching but our faces smiling as we simply enjoyed the sights along the dirt road. We were absorbed in our surrounding: wild horses grazing, the ocean waves crashing against the jagged volcanic coast line and the moai’s, standing at attention in their immortal pose. The rough volcanic coast line. We observed as the heard of equines raced past us on the other side of the fence and looked on as this cowboy, with no footwear, spotted us and came trotting over to chat. He was wearing a scarf as a bandanna low over his eyes, a hoodie and dark jeans rolled up to mid calf length, exposing his bare feet. His skin showed off a deep tan that he no doubt earned working outdoors all day, and a mustache that seemed to soften his weather-beaten face. With him using his broken English and us stumbling through Spanish, he asked where we were from, how long we were visiting for and the usual exchange that happens between locals and foreigners. We told him about this incredible cave we’d accidentally discovered, not far from his farm (turns out it was Ana Kakenga cave, but we didn’t know it at the time. We’d simply been wandering the island that day with no map or guide book). Looking out one of the 2 caves that make up Ana Kakenga Cave (commonly known as ‘the cave of 2 windows’). Seeing our keen interest in the natural features of the island, he asked if we liked petroglyphs. We said we did, not sure where this was leading. 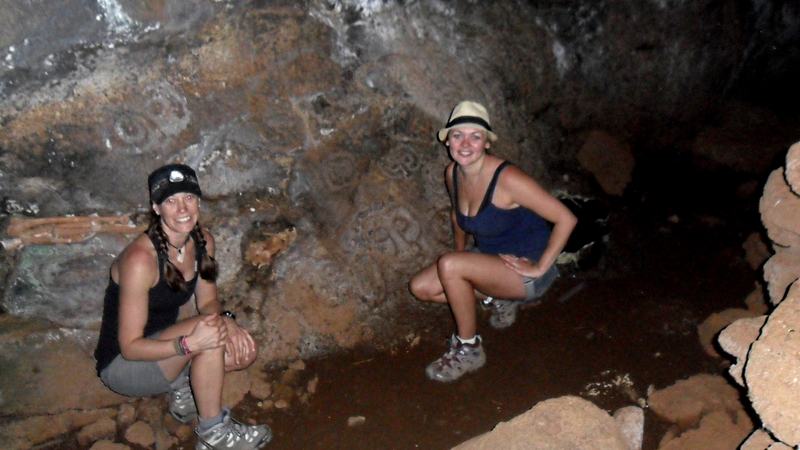 He proceeded to invited us onto his family’s property to see a cave filled with ancient carvings and paintings. But first he had to take his horses home so if we’d just wait by the gate, he’d be back in 5 minutes to take us. My friend and I had been having such a great day exploring the island we thought, sure, why not? We were letting the universe be our guide and it seemed that this was going to be another magical serendipity that Easter Island was bestowing upon us. Horses gazing by the coast. We took a seat on the grass beside the fence as our cowboy took off towards home, chasing his heard all the way. About 10 minutes later he came riding up to us and opened the gate, inviting us in. We walked while he rode along a path through the fields that had been occupied by the horses only minutes ago. After a short walk we came upon a large rocky outcrop with one small little opening, just large enough for us to squeeze through. Had our cowboy not pointed out this rocky area, I’m sure my friend and I would have walked right past it, never knowing there was a secret cave system right underneath our feet. One by one we scrambled down into this little cave. Shinning our headlamps around we soon found several hand painted objects and carvings adorning the rock walls. Our cowboy told us that the paintings had been done by his ancient ancestors, many years ago. My friend and I were amazed at these seemingly unknown works of art, preserved below the ground for centuries. Jo and I looking at the ancient petroglyphs. Exploring the cave further we discovered that it continued on, moving deeper and further into the underground. Always wanting to explore more, we went from the initial room we were in, through a small opening that lead to yet another cave room. This seemed to continue on for who knows how long. We didn’t venture too far for fear of getting lost in this unexplored cave system. After spending some time observing the petroglyphs and wondering out loud about the mysteries that lay hidden in this labyrinth of caves, we returned to the daylight and thanked our barefoot cowboy for the unique tour. 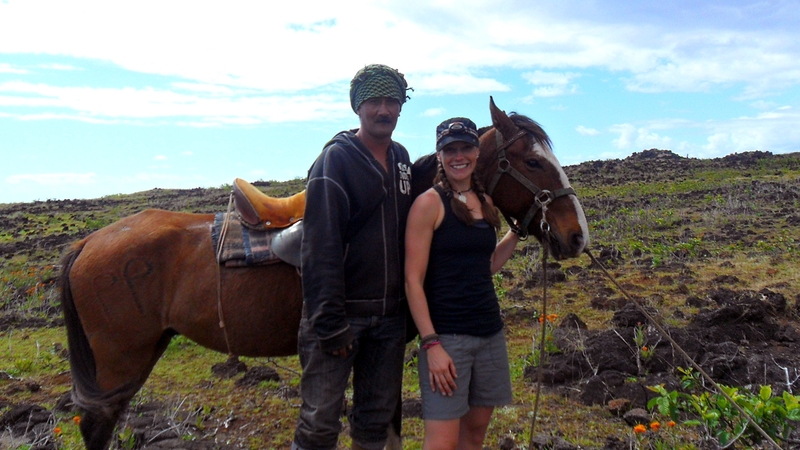 He posed with us for a few pictures and then lead us with his horse back to the dirt road we’d been walking on. Posing with our barefoot cowboy and his horse. While making the weary walk back to town my friend and I marveled at the completely unplanned, random day of discovery we had just experienced on this mysterious island. Serendipities like this are what travel tales and adventure stories are made of and one of the things I love most about exploring far off lands. Yes, Easter Island was incredible! It’s amazing what such a tiny little island has to offer. I want to go back again some day! Thank you! Easter Island was amazing, I’m sure you’ll make it there some day!